Scott Adams is Master Persuading all over this election. 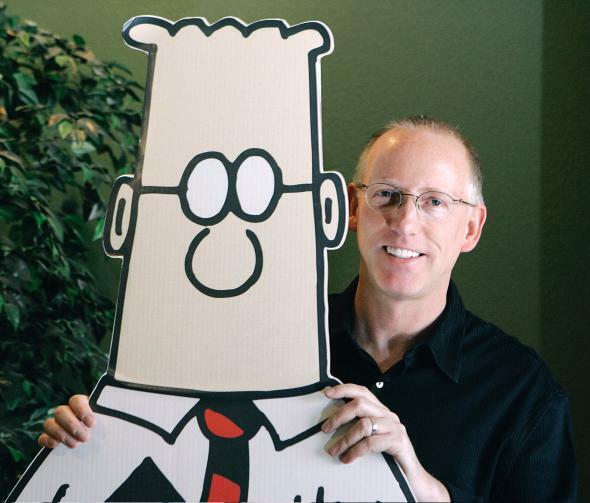 Graphomaniacal blogger and Dilbert creator Scott Adams poses for a portrait with the Dilbert character in his studio in Dublin, California, on Oct. 26, 2006. So says Scott Adams, creator of Dilbert, graphomaniacal blogger, and (if he does say so himself), “the best political predictor in the history of Earth.” Adams—who is 59 and lives in Northern California—has lately gotten a good deal of attention for having foreseen the rise of Donald Trump. That the creator of an anodyne and highly successful comic strip about office culture should have a minor role in this election is not quite as surprising as it seems. Dilbert seems to function largely as a business endeavor for Adams. His true calling is advocating on behalf of his own colossal brilliance. Trump vs. Clinton is merely the latest and largest forum in which Adams has sought to prove his case. He arrived on the pundit scene with a splash: He announced way back in the summer of 2015 that Trump was going to win the Republican nomination. He came to this knowledge not via fancy polling models or sophisticated political science analyses, but just by watching the election unfold through what he calls his “Master Persuader lens.” Adams is a trained hypnotist, and as such he can’t help but recognize the mesmeric brilliance of nearly everything that Trump says and does. Here he is after Trump’s call for a ban on Muslims: “By the 2D filter, where people use logic and reason to make decisions, Trump is dead and done. … But in the 3D world of emotion, where Trump exclusively plays, he has set the world up for the most clever persuasion you will ever see.” We mortals supposed that the election would play out as a contest of ideas. Adams, like Trump, recognized that it would instead play out at the limbic level of primal furies and genital anxieties. This past year, Adams has been taking to his keyboard as often as 10 times a week to remind the world of the scale of his accomplishment. He has not (until just this past week, anyway) been carrying on like this out of any desire to see Trump win. Far from it. He merely sees in Trump a Master Persuader of world-historical significance, and what with Adams being a Master Persuader himself, well, greatness can’t help but recognize greatness. On Sunday, driven largely by concerns about estate taxes and about Hillary Clinton’s health, Adams did finally endorse Trump, but again, this was a matter not of partisanship but of helplessly superior perception. As a hypnotist, Adams has been taught to read “subtle bodily changes,” and he could no longer ignore what Clinton’s eyes and complexion were telling him. To read his blog—and I recently spent a week mainlining the 1,000-plus pages that he’s published in the 15 months since Trump declared his candidacy—is to overdose on a custom blend of testosterone, paranoia, and self-celebration. Here he is explaining that in the event of a Trump victory, he, Adams, “would be a top-ten assassination target.” Here he is lamenting the “humiliation of the American male,” as evidenced by a dishwasher detergent ad. Here he is unforgettably (I’ve tried) attempting to hypnotize his readers into having the best orgasms of their lives (“I want you wet, or hard, and especially obedient …”). I embarked on my week of Adams immersion in the hopes that it might help me gauge the proper degree of alarm to feel regarding his prediction of a Trump landslide (after a brief and uncharacteristic period of wobbling this summer, he has lately resumed giving his posts titles like “How to Know an Election Is Over”). Was Adams a crank who’d gotten lucky? Or was he a “super-wizard” (his term) to whom the future was no more inscrutable than a movie marquee? I have, after all my reading, come to be skeptical of Adams’ predictive powers. He guessed that Trump would win the Iowa caucus, and then when he didn’t, Adams spent 1,000-plus words laying out the case for its having been rigged. He predicted that the Democratic Convention, due to its testosterone-dampening effects, would lead to history’s first post-convention anti-bounce. Adams may well be right that Trump will win in November, but his predictions thus far have tended to bear a suspicious resemblance to his desires: that henpecked husbands should rise up in rebellion, that Adams’ particular skill set should prove to be unbeatable. This isn’t to say, though, that his blog is without value. I believe, in fact, that I’ve found in it something even rarer and more precious than a crystal ball: I’ve found a portal into Donald Trump’s head. But Adams and Trump are not just characterological twins. Throughout Adams’ blog they are also, thanks to their shared stake in the election, riding side by side on the same psychic roller coaster. First came the audacious early confidence (“Trump will win Iowa and run the table”). Then the months of trench warfare (“I see that Trump is bringing a flamethrower to a stick fight, but most of you only see a stick in his hand …”). Finally the endless, orgiastically affirming victories (“The Master Persuader filter continues to predict with spooky accuracy”). Every time Trump wins, Adams wins, too—Trump is the giant crushing his rivals one by one; Adams is the genius who saw that he would do it. But Adams’ blog is more than just the lesser-known cousin of Trump’s Twitter feed. Adams has actual expressive gifts and the inclination to use them. He is Trump injected with truth serum, Trump without the need of a ghostwriter. By going on for thousands of words where Trump uses a dozen, Adams can’t help but make visible—in a way that Trump would never dare—the costs of keeping such a massive ego machine running, the places where the gears grind and stall. Adams is revealing something genuinely touching here: that his braggadocio is partly an act, a means of psyching himself up. He was once, as he says, a man with “no obvious artistic talent and no training whatsoever,” and he has, by harnessing narcissism, achieved great and indisputable success. But the rest of his blog demonstrates, with the clarity of a fable, how dangerous it is to set an ego machine loose in one’s inner command center. As his rightness about Trump became more apparent throughout last summer and fall, Adams’ blog changed—posts started getting longer and more frequent. His updates began to multiply. More and more of his blog was devoted to things that other people had written about him, or to praise he’d gotten, or to people he’d humiliated. The dreary repetitiousness of compulsion crept in. His ego worked very well for him, in other words—it earned him the freedom to do whatever he wants, whenever he wants—until the only thing it let him want was to be right about something, and to be praised for it. Which brings me back, of course, to Trump. One way to think of him—and the way I’ve always thought of him—is as a narcissistic and spectacularly un-self-aware ogre. But another, and possibly truer, way to think of him is as a man who at some point discovered the singular force of the ego engine (look at those buildings! look at those wives!) but who now, though it may yet bring him a job for which he is ruinously unfit or humiliation on a scale he can’t fathom, doesn’t know how to switch it off. So there’s one more, grubby truth with which I emerged from my week spent waist-deep in Adams’ psyche: that I’d already known what it’s like to be Trump—that in fact I’ve got a little Trump buzzing away in me even now. It’s the part of me that, more than a few times, has daydreamed about what it would be like to visit Adams’ blog on the day after a Clinton victory, that little inner end zone dance. And it’s the part of me that would experience a Trump win less as a historic disaster than as a personal humiliation. It’s the part, in other words, that thinks of the election’s global implications as mere packing peanuts around the real prize: having been right all along.